Novelist Brian Ruckley (The Edinburgh Dead and the Godless World trilogy) has revived one of 2000 AD’s most iconic characters for the next generation of post-apocalyptic comic fans in the new series Rogue Trooper from IDW Publishing. 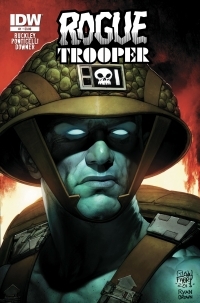 Ruckley’s Rogue Trooper #1 is the writer’s first attempt at a serial script, and he has stepped into this format slowly and carefully in order to preserve the mystique of the title character. Rogue, also known by his call sign “Blue,” is revealed for the first time in color in the ruined landscape of Nu-Earth, where he was created as one of an army genetically modified to breathe the poisoned air and endure dangerous levels of radiation. The last of a massacred unit of super soldiers, Rogue is convinced that he and his brothers in arms were somehow set up and ambushed. His mission now is to find out who might have been behind the ambush and why. Each and every week, I, “Fullmetal Alchemist” Henchman21, and “Heavy Metal Alchemist” Empress Eve read a lot of comics. Seriously you guys, a lot of comics. Maybe too many comics. I mean, it is possible… theoretically. Naturally, we look forward to some more than others. I mean, who doesn’t? So, let’s take a look into the depths of our pull lists, grab some comics, and we’ll let YOU know what the top books to look forward to are for the week of August 7, 2013. Single issues and trades, they’re all here. It’s another one of those weeks where a lot of my favorite series have new issues, but we also get a few new series to sink our teeth into. And sadly we see the end of a series that just couldn’t find its audience. We’ve got all that plus so much more, so let’s not waste anymore time as we get ready for another edition of The GoD List! Each and every week “Firework Fred” MK2Fac3 and “Firecracker Frank” Henchman21 read a lot of comics. Seriously you guys, a lot of comics. Maybe too many comics. I mean, it is possible… theoretically. They look forward to some more than others, I mean, who doesn’t? So, let’s take a look into the depths of their pull lists, grab some comics, and we’ll let YOU know what the top books to look forward to are for the week of July 4, 2012. Single issues and trades, they’re all here. Um, yeah, sorry about the delay, folks! We were just sitting over here drinking non-alcoholic beverages in celebration of freedom and such, so we got a little too distracted by the holiday to get this up in time. You forgive us, right? Sure you do. I mean, I’m sure that you might have gotten distracted by all the booms and crackering of fireworks too and missed picking up new comics, right? That’s what I thought. Well, there’s a decent amount of stuff that came out this week, but a lot of it is more new issues than new comics, you know what I mean? Not a lot of fresh pickings. Nonetheless, you should read on because there are new comics to love and behold. Which ones? Like I said, you’ll need to read on for The GoD List. DC Comics announced on Thursday that they would be setting up the second wave of “New 52” releases while also canceling six ongoing comics that were released in the initial run of the DC Relaunch. Resting in peace are six comics that were quite good and enjoyable or had a lot of potential to be great, so they will definitely be missed. Those comic books are Blackhawks – a war comic focusing on a group of militaristic mercenaries in the vein of G.I. Joe; Hawk and Dove – the only DC book written by the extremely talented Sterling Gates with art from Rob Liefeld (more on him in another article); Men of War – a war book that was one of my favorite comics of the relaunch that took a realistic approach to the military in a world full of superheroes; Mister Terrific – one of the very few DC comics with a person of color as the leading role. Also, the main character was highly intelligent and, interestingly enough in a comic, atheist. O.M.A.C. – this to me is a tragedy considering that it was a fan favorite even in the light of poor sales. Sure it’s bizarre and nutso, but it was a complete blast to read. And finally Static Shock – one of, if not the only book that could be considered “youthful” and “fun,” and also one of the few books starring a person of color. All of these titles will see their last issues in April.